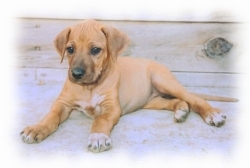 In 1954, Rhodesian Ridgeback Breeder Margaret Lowthian Cook profoundly shaped the future of the African Lion Hound when the first Rhodesian Ridgeback puppy was proudly whelped under the Lamarde Perro banner in southern California. It is no exaggeration to say that nearly the entire foundation of the breed in the United States can be traced back to this great legacy in one form or another. 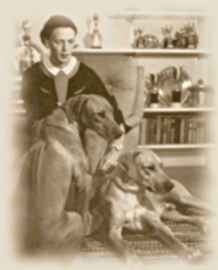 Mrs. Cook originally raised quality Weimaraners but shortly after becoming acquainted with the Rhodesian Ridgeback, she began pursuing interest in the breed full time and made several visits to the South of Africa where she visited with such noteworthy kennels as Thornbury. She also became acquainted with the renowned Rhodesian Ridgeback Judge and expert, Major T.C. Hawley, from whom she gleaned a good deal of the knowledge she would later use to build the foundation stock of what would become known as Lamarde Perro Kennel. During the Formative years of Lamarde Perro, Margaret also teamed up with Gene Freeland. It is probably easy to underplay the significance of Gene, as Margaret was the person who traveled to South Africa, met with Major T.C. Hawley, visited all the kennels, and imported many dogs, including the purchase of some from Col. DePass. During the late 1950s and early 60s, Lamarde Perro boasted of about 100 dogs, in an active breeding program that included selectively breeding or culling for any undesirable traits, especially temperament. Gene was an architect/engineer who could design buildings and sign off as architect and structural and electrical engineer. Mr Freelands primary contribution was financial, and he brought considerable scientific savvy to the table. In the early 1950's a few early breeders including Bill O'brien, Morris DePass, Gene Freeland, and Margaret Cook were successful at getting AKC recognition of the breed. Margaret Cook mentored many people in the United States and most of the major kennels to day owe a debt of gratitude to the Late Mrs. Cook for her care and direction which has helped to positively and indelibly mark the Rhodesian Ridgeback breed in the United States. In her last few years, she mentored her son and daughter (John and Sally Cook) and the tradition of producing top show dogs has continued almost without interruption. Today, the Cooks are deeply involved in protecting the legacy that they have inherited as Rhodesian Ridgeback breeders. They are still producing top champions, and multiple best of breed winners while making soundess of health, structure and temperament the focal point of their breeding program. Recognizing their responsibility as the premier Rhodesian Ridgeback puppy breeders in the Southern California area, and the United States, The Cooks are a pivotal force for education, welfare, and protection of the breed.